I’m not that excited about the Super Bowl this year. I nearly killed myself watching Peyton lose to the MOTHER EFFING Ravens. And after that, I was like, Meh. Meh. Meh. But I do like eating. Hubs and I tested out these last weekend, and he was all like, OMG girl, total pigskin food. Okay, he didn’t say that. But he did eat almost all of them, even though they have potatoes in them, and he’s like, scared of carbohydrates right now. So that should tell you something. Please don’t think that because I’m posting these, and I’m a Health Coach, and there aren’t actual “chips” that this is a super healthy recipe. It isn’t. 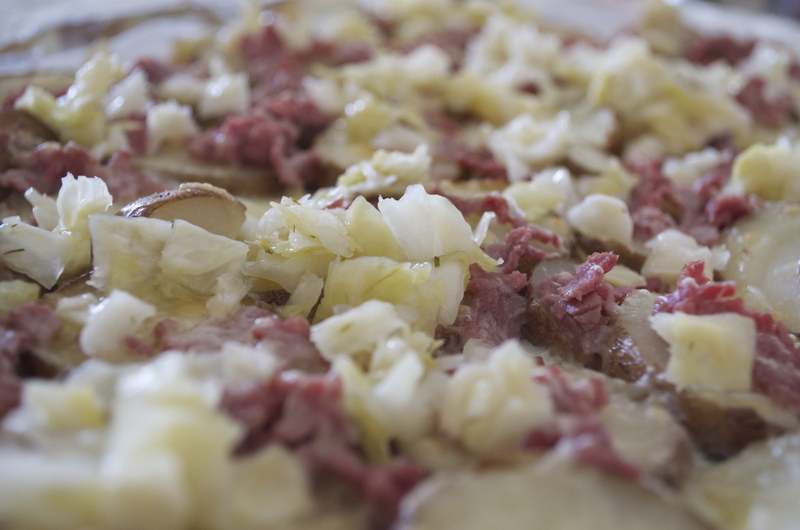 Starch + fat = delicious. It also equals squishy tummy, if you decide to make a habit of it. So, consider yourself warned. This recipe is more like a guideline. And it’s very forgiving. Just don’t burn it. Sauerkraut. I use the Dill and Garlic variety of Wildbrine. I love it. 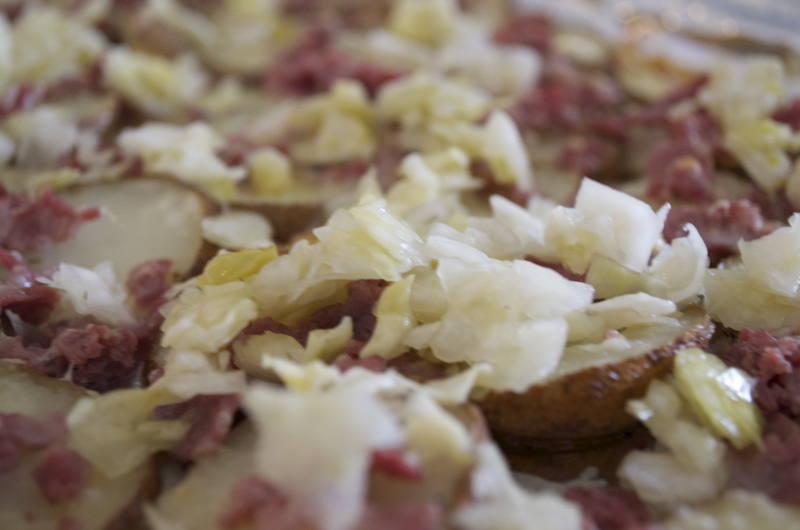 Once your potatoes are cooled, slice them into thin “chips.” Arrange on one to two cookie sheets that are lined with foil. 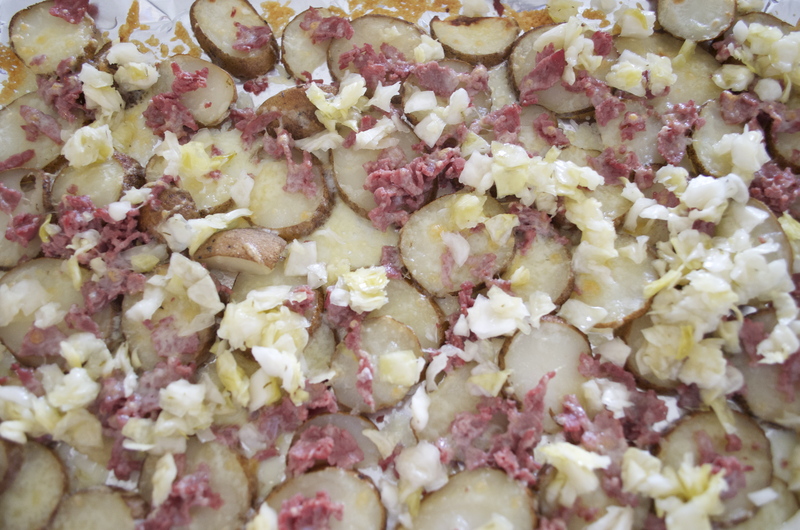 Top the potatoes with the shredded cheese and the pieces of corned beef. Pop the sheets in the oven and let them broil until the cheese is all nice and melted. Careful not to burn! Depending on your oven this could be anywhere from 2 – 8 minutes. Stay close. 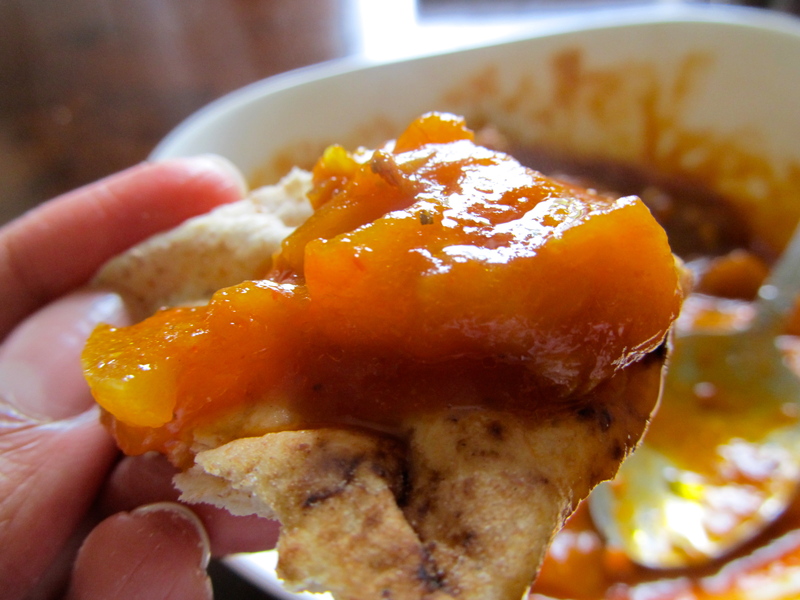 Pull the sheets out, and sprinkle the “nachos” with your sauerkraut, an amount that pleases you. Serve with dipping sauce of choice. 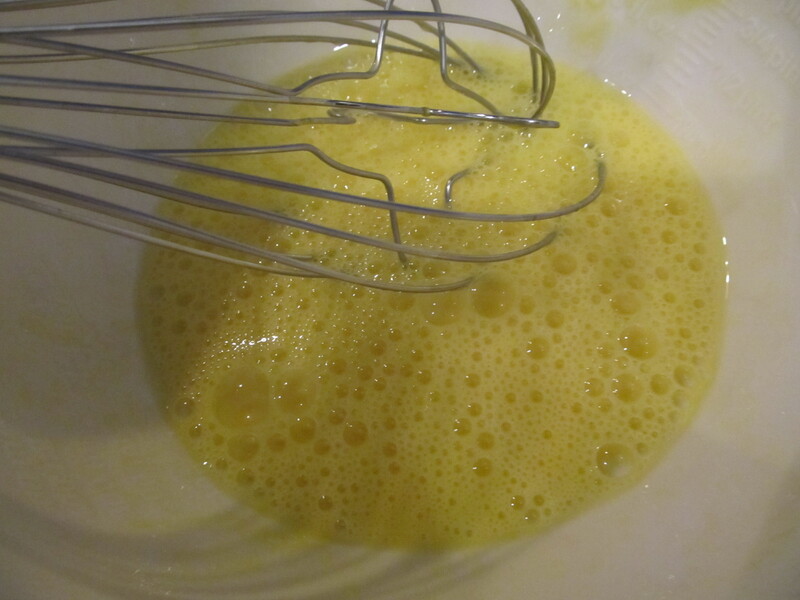 I made a delicious sauce of 1 part dijon mustard to 1 part mayonaise, with a dollop of ketchup for color and sweetness. Super yummy. And since this little treat is full of all real, identifiable ingredients, including the fabulous probiotic properties of raw, fermented sauerkraut, you can feel a little better about pigging out. What are some of your favorite Super Bowl treats? So, this is the best. I cannot imagine why I never made an omelette with a sweeter side before. I was really missing out, but don’t worry, I’ll be making up for lost time! I used frozen blueberries. Wyman. They are my favorite and I always have a big bag in the freezer. Blueberries are probably the one and only thing I prefer frozen to fresh. You could use fresh though, just cook them a little longer I think. It’s hard to go wrong. 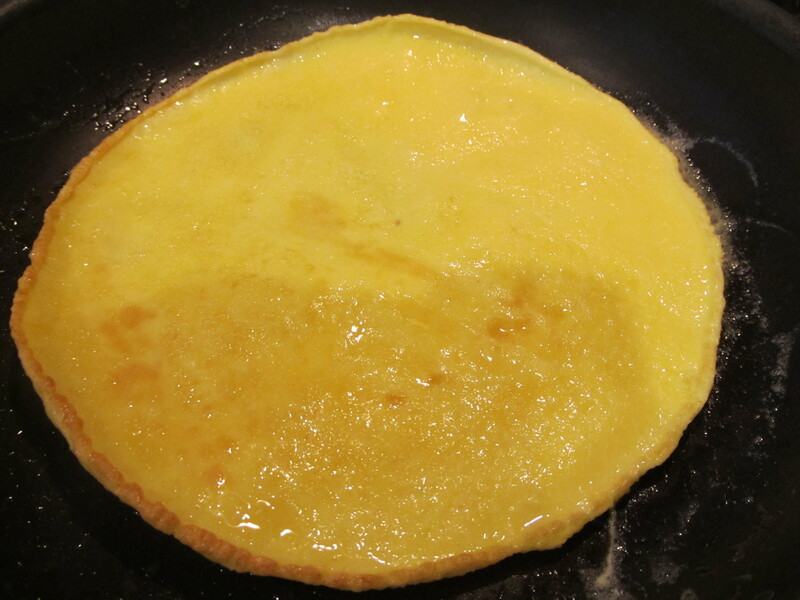 This recipe is whole30 compliant if you cook the omelette in ghee or olive oil and omit the added sweetener. 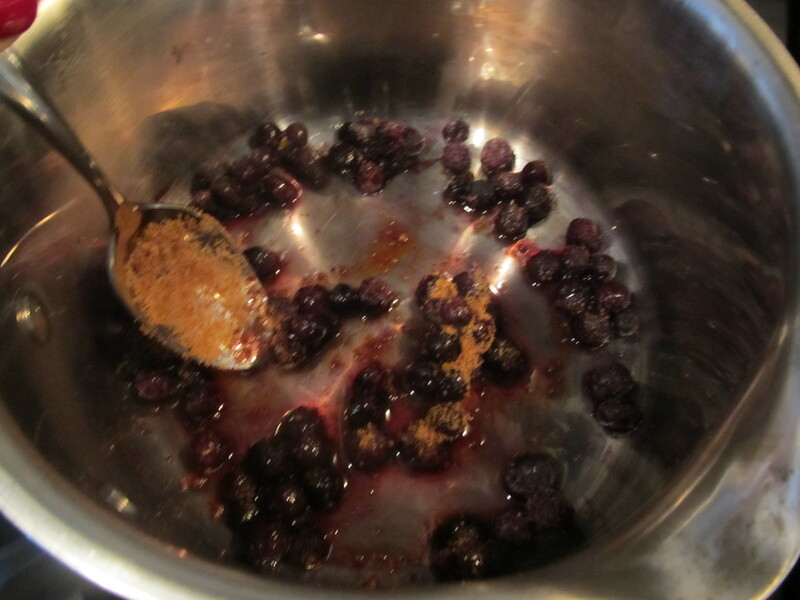 Over medium heat, put your blueberries, sweetener, and a touch of water in a sauce pan. Stir it up, keep it on medium heat to warm through. Beat those eggs like you mean it. Butter that pan like you mean it. Medium heat in a 12 inch skillet. Let it heat up fully. Check on your blueberries for a moment. Raise heat up high for a few seconds, then put it on low and keep it there. Pour in your eggs. Let it cook for about 2 minutes – the edges will look a little bubbly and if you move the pan around a bit it should slide easily. Flip it. Careful not to burn it. 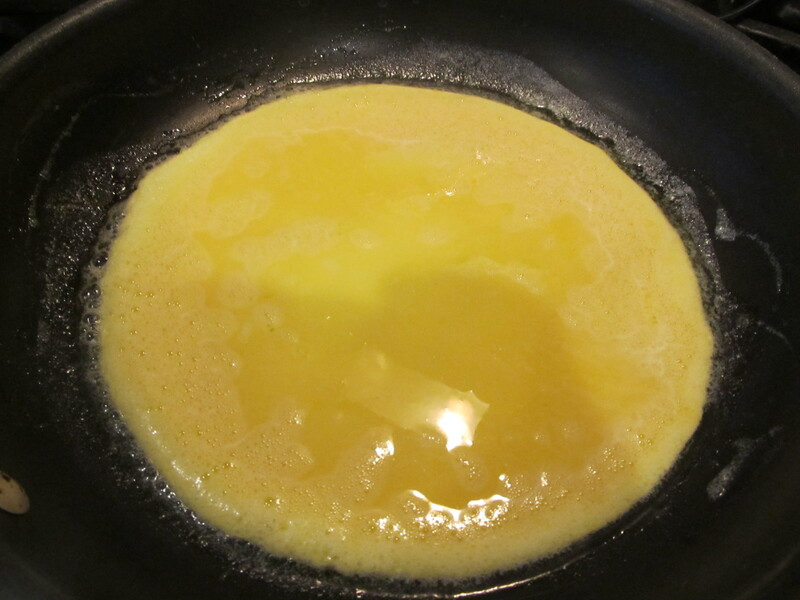 Burn omelette is yuck. Cook a little longer then flip onto your plate. 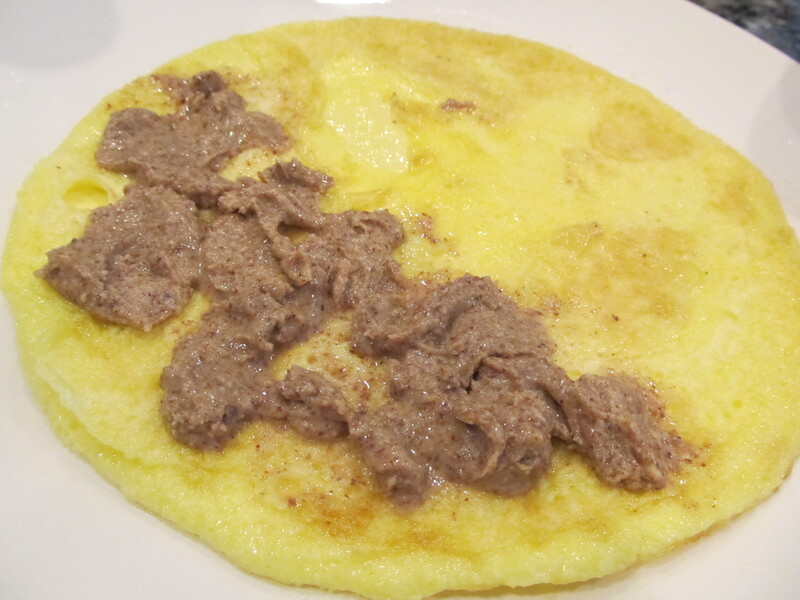 Fill your omelette with your nut butter. Maybe I lied about the quantity. Let your heart be your guide. 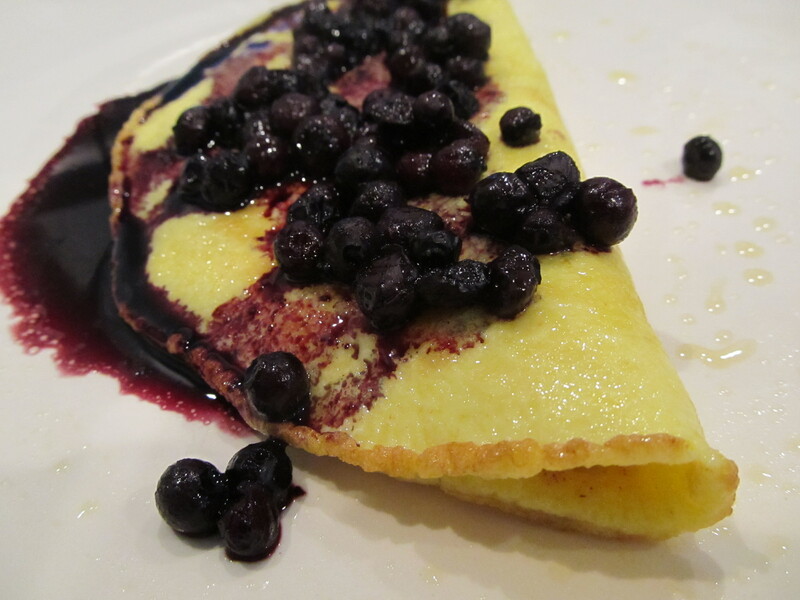 Pour your blueberries over the omelette. Eggplant, for me, is one of those vegetables that can either be a culinary masterpiece or akin to eating a dirty old shoe. That’s really how I feel about it. I’m often conflicted as to whether or not to order it at restaurants, because just the slightest bit of undercooking and it’s just inedible to me. I don’t really know of another vegetable that I find downright repulsive when it’s not cooked within an inch of its life. Wow. I’m really talking up this poor veggie, huh? Up until recently, I’ve had mostly fails when it comes to cooking eggplant. And I know why now – I’m not patient enough to cook it the way it needs to be cooked. But now that I know how to roast it, I’m a baba ghanoush fiend. And I now have one more eggplant dish to add to my repertoire. Can you SEE how melt-in-your-mouth delicious that chunk of eggplant is? It’s like velvet butter. We’ll just call this what it is. note: You could use two eggplants and one entire jar of tomato sauce (25 oz I think). The eggplant I used was not super large. 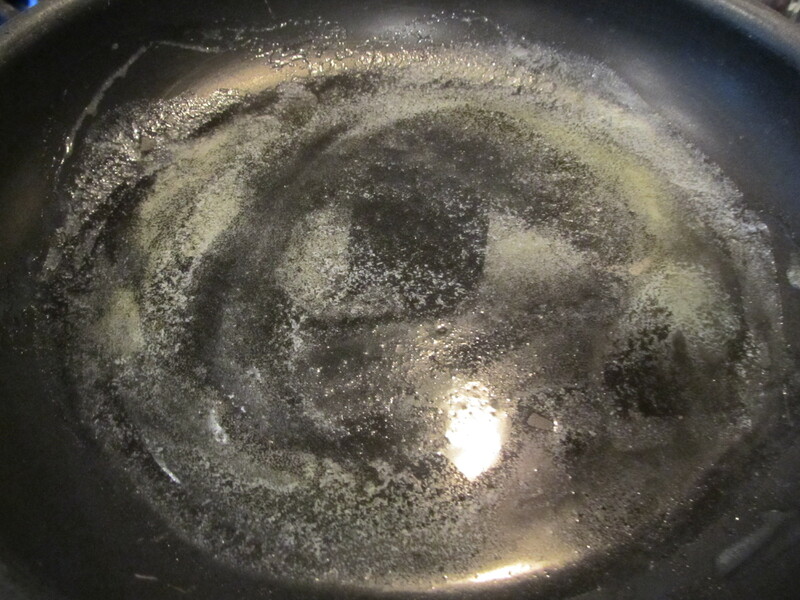 In a skillet, melt your butter and olive oil together, then add the garlic and onions. Sautee for about 2 minutes, until the onion is a bit soft and shiny. Add cumin and tumeric, mix it all up. Add your eggplant chunks. Sautee for about 7-10 minutes, adding a little water to the pan to keep things from sticking. In a large saucepan, heat your tomato sauce and add in the tumeric, cumin, and cayenne. This would also be the time to add sugar if you’re using it. 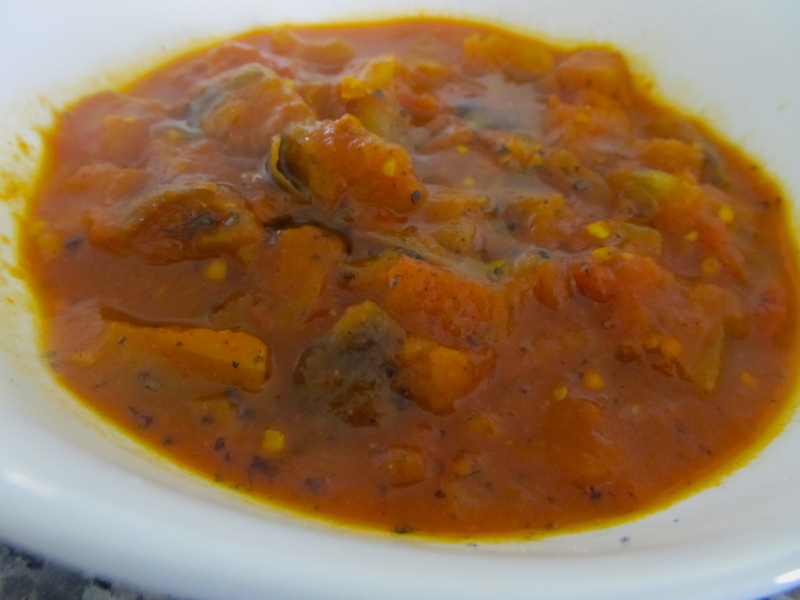 Once your tomato sauce is hot, add the eggplant and tomato mix to the saucepan. Stir to combine, you can sprinkle in a touch of salt. Add water slowly to loosen up the sauce. It should be a bit liquidy, as the eggplant will soak it up. Heat to simmer, then put a lid on and keep the heat on low. 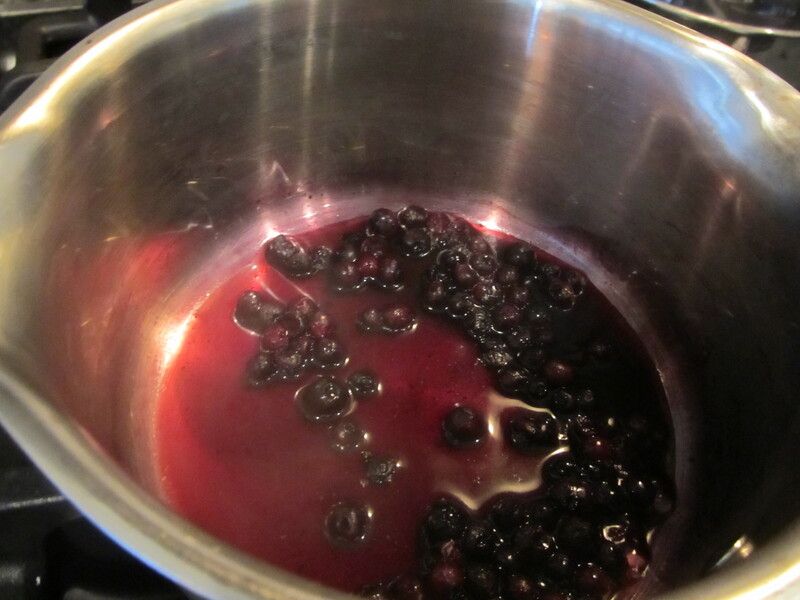 Simmer for 1 hour. Check on it every 10-15 minutes, give it a stir, see if you want to add more water, etc. Serve hot, room temp, or cold. Drizzle each serving with a touch of olive oil and a sprinkle of sea salt! I hope you enjoy this one! I ate mine with a bit of whole wheat lavash. It would be equally delicious with some couscous or quinoa too.